You know how you have a cup full of pens on your drawing table but you always reach for that certain one or two? You tried many pens to find your favourites. Each artist will have a different reason for their choice: the blackest, the most controlled line, the least controlled line with the most natural variation, the flow of the ink, the feel of the tip on the paper, if you can do a wash over the top and so on. So you can’t say which pen is the best, only which pen is the best for what you like or what you are drawing at the moment. The performance of a pen also depends on the paper on which it is being used, so the paper and pen combination matters a lot. To help you choose the pen that is right for you we asked a lovely illustrator we know to help us gather some information about the differences between the wide range of drawing pens we stock. This test isn’t of all our pens as the range is very great but includes some of all categories: marker pens, brush pens, dip pens, fineliners (disposable) and technical pens (refillable or cartridge). The testing will give you an idea of the differences in performance of the pens and the papers. 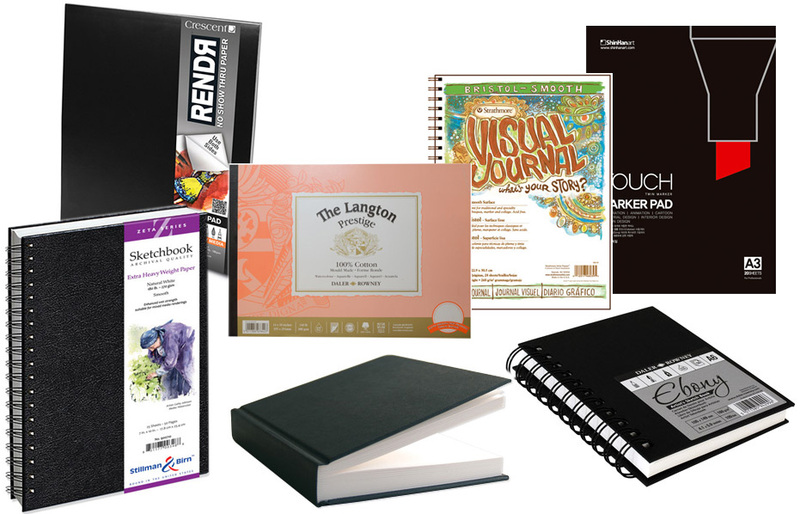 Because pen and ink drawing is usually done on smooth papers we selected a hot press watercolour paper (which will have some sizing added to reduce its absorbency for wet media), three cartridge papers, two marker papers and a Bristol board. It looks like some of the results of the testing were expected and some were surprising. Many of the pens were of good but similar quality with a few that excelled for different reasons. 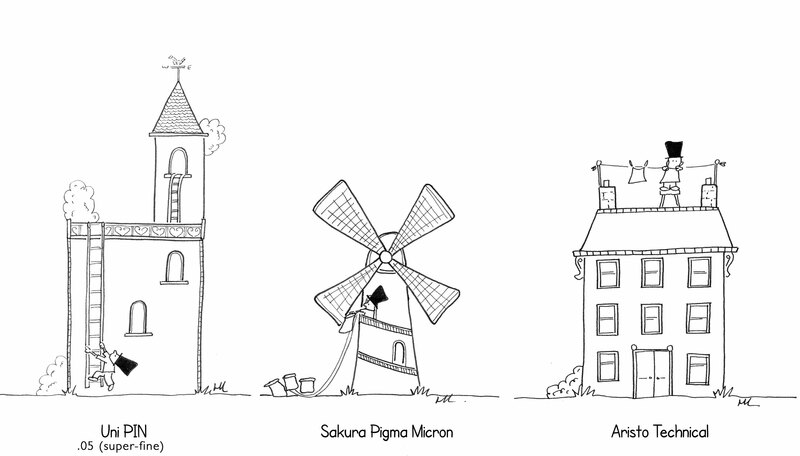 It is good to see that our new Sakura Micron is a favourite! It is “a dark black disposable with a really enjoyable ink flow”. The Aristo Drawing technical pen is another favourite being “the darkest black fineliner overall”. In terms of papers, the Stillman & Birn paper came out on top as the most versatile across all pens used in this test. It sounds like the marker paper and Promarker findings will inspire a future review focusing just on marker pens specifically. H Locke is an illustrator in East London who draws with pen and ink on paper, mostly buildings and cartoons but occasionally branches out into other areas. H’s love of pens and papers is clear and we appreciate all the time and effort put into the thorough testing! Thanks H! If you don’t wish to read all the information you can skip to the Conclusions. My work is primarily black and white ink drawing on paper. Occasionally I use watercolours over black ink, so I’m always interested in waterproof black ink and suitable papers. This review will inevitably be biased towards the things that are of most interest to me in my practice, though I have attempted to consider a range of uses, techniques and approaches. I generally work in Uni Pin, Rotring, Pentel Pigment Brush and dip pen and ink. In my work, I like ink to be very black and waterproof with no feathering. Some of the pens and papers in the test were new to me. A total of 13 pens and 7 papers were tested. Blackness – How dark the ink is, both at application and after drying. Feathering – The fine lines that seep out from the drawn ink line on some papers. (Some products call this ‘bleed’ so to reduce feathering, you may want to look for ‘bleed-proof’ papers. This is not to be confused with bleed-through, described below). Smudging/waterproof – Whether the ink is smudge and/or waterproof after 30 seconds of drying time. 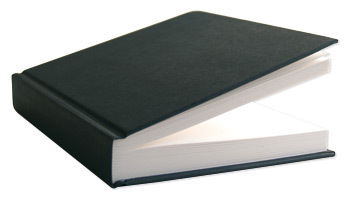 Bleed-through – When the ink is visible on the back side of the paper, because it has literally bled-through. Show-through or ‘shadow’ – When the ink has not bled all the way through, but is visible enough that you could no longer use the back of the paper for another work. Flow – A subjective criteria usually referring to the speed and smoothness of ink delivery. Used most often in relation to consistency of line. Finally, I gathered some general information on the performance and experience of using each pen overall and my own personal preferences based on the kind of work I do. 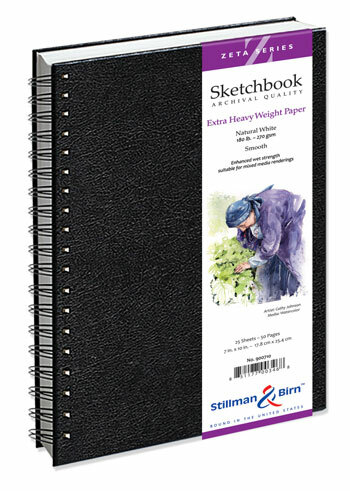 The Jackson’s sketchbook has a nice mid-smoothness with a substantial cottony feel. It scores in the median for whiteness, thickness and sizing. It behaves well with a light wash of watercolour paint with no buckling as the paper dries. Naturally, with a paper of this type there is bleed through with the solvent-based Promarker, but not so much that it bleeds into the sheet behind. This paper is surprisingly nearer a Bristol Board than cartridge paper in texture – smoother in feel than the Jackson’s or Daler-Rowney Ebony paper and this is reflected in the ink behaviour with longer drying times and the tendency of watercolour to sit ‘on top’ of the paper. Because of this however, one can benefit from the limited bleed-through and overall, the drawing experience is rather nice with smooth lines when drawing across all pens, but with more texture to the paper than the card-like Bristol Smooth. The RENDR pad is possibly the strangest of all the papers and one I’ve not encountered before. It’s designed to guarantee no show-through or bleed-through (with the ability to draw with solvent markers on both sides) and is therefore unusual in appearance. First, it is almost grey in colour, particularly when compared to the other papers tested (see my photo that compares whiteness). Second, although a smooth surface to draw on, you can see a faint speckled texture beneath the smooth exterior. If you hold it up to a light bulb it’s more obvious. It also has a chemical smell upon opening, one assumes this is part of the treatment which makes it suitable for working on with solvent-based inks. As claimed, there is no hint of show-through shadow or bleed-through on the back after the ink test, even with the Promarker solvent-based pen. This paper behaved the strangest with water (leaving a grey shadow on the paper even when dry) and, randomly, created immense amounts of feathering with the dip pen (more detail in the pen review below). 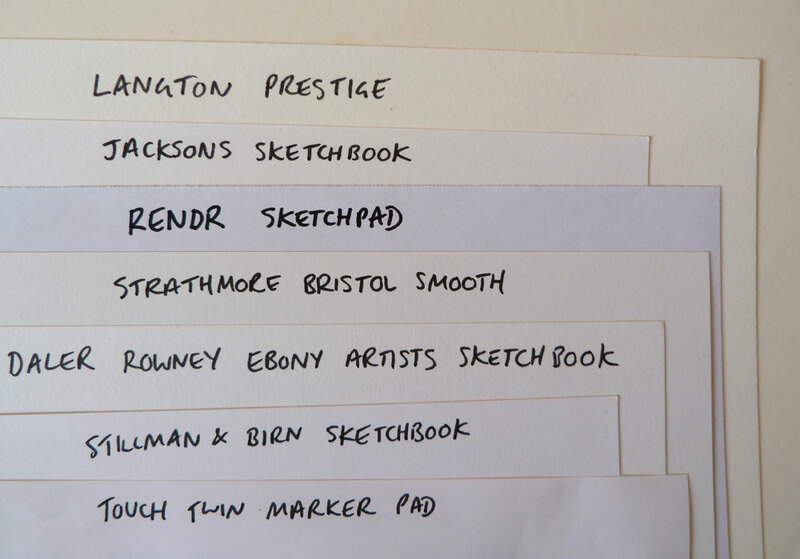 The Daler Rowney is comparable to the Jackson’s Sketchbook, with perhaps a whiteness a little more towards the grey than the cream of the Jackson’s and Prestige and a slightly smoother texture and the bleed-through on solvent-marker is a little less than the Jackson’s paper. It’s worth saying that neither of these papers is designed for this type of solvent-based marker and show no bleed through or shadow on any of the other pens used in this test. Strathmore as a bristol board is thick, card-like and extremely smooth. 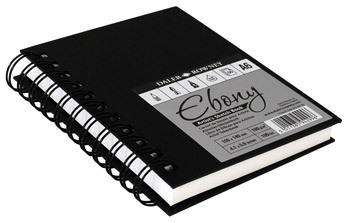 It has a slightly more creamy colour compared to the Daler-Rowney or Touch Twin papers. Although not as targeted to the solvent marker user as the RENDR, it certainly holds its own in preventing bleed-through (though I wouldn’t suggest you should rely on being able to use both sides with Promarkers for example). Naturally with a Bristol board, there were some issues around slower drying times because of the hard, extra smooth surface. Most inks may take about 2 minutes to dry rather than the 30 seconds I used for this test. The Touch Twin is a standard marker paper, in that it has minimal feathering of the ink. It is comparable to the Daler-Rowney marker pads I have used. It’s very smooth, very lightweight and thin, to the point that it could almost be used as tracing paper and would certainly work with a lightbox. Because of this, it is not appropriate for water or watercolour and suffers from both shadow/show-through and bleed-through, particularly on solvent-based inks such as the Promarker. Bleed-through on the back of the Touch Twin Marker Pad. 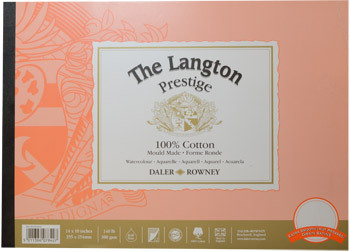 The Langton was the only watercolour paper of the papers tested. It has the most texture of all the papers tested, but because it is a hot press paper it has almost no texture compared to a traditional cold-pressed/NOT watercolour paper. My comparison therefore is primarily based on ink behaviour rather than paper qualities. It’s thick, creamy in colour and responds well to watercolour paints, as expected. 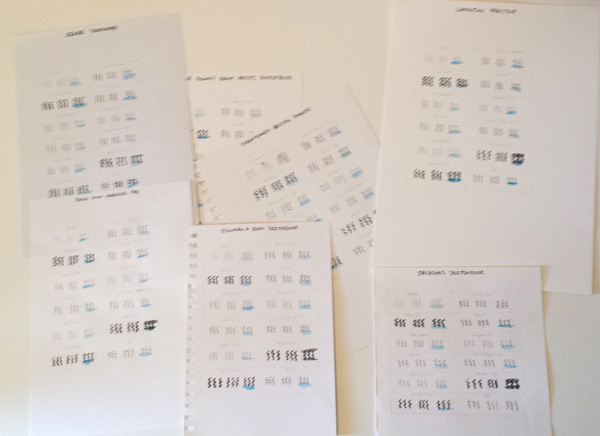 Even with the Promarker, there is more of a shadow show-through than a bleed-through which is due to the paper thickness (similar to the Bristol Board in this test). In order to get a clear comparison of pens and papers, I created a test grid on each paper, testing the same pens with a 30 second smudge-test followed by brush and water/watercolour paint test. I chose 30 seconds of drying time as a benchmark because any longer in my work risks smudging or slows down the drawing process. Diagram showing the four tests carried out on each pen, on each paper. 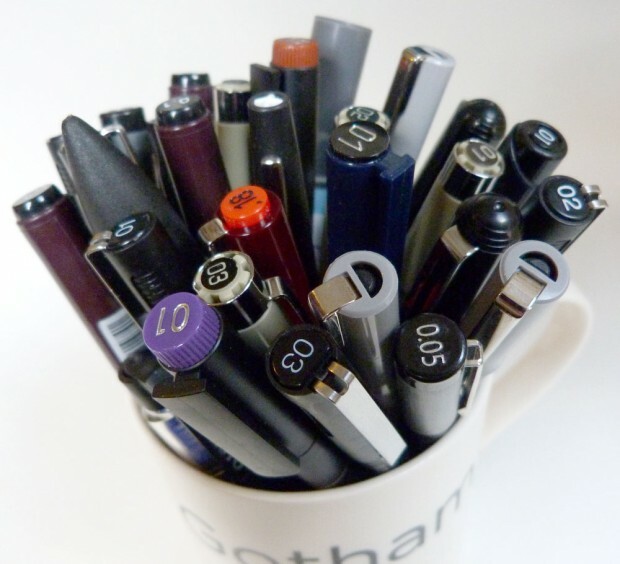 The pens tested included disposable drawing pens, cartridge-based/refillable pens, brush pens and dip pen nibs. The test grids used in this review. I use Rotring Rapidograph in my work because of the fineness of the line and the blackness of the ink. However, I know from first-hand experience that the ink tends to run with any wash applied over the top of the ink (even when dry) therefore I use this pen for black and white only (no wash) or on top of a dried watercolour sketch. I also take care to allow extra drying time when using this pen on bristol board as it tends to smudge. In this test, the Rotring varied considerably (across several criteria) from paper to paper more than any other pen used. On smoother papers (Strathmore Bristol Board and Stillman & Birn) there was considerable ink run on the water test. In fact, there was some ink run (when used with water) on all papers except the RENDR. Rotring nibs are very fine and produce a smoother line on smoother paper as the nibs tend to catch on very textured paper. This was the case in this test. However, one of the most interesting findings in this test was that on the Strathmore Bristol Smooth the Rotring line produced a tag (or “blob”) at the start of the line. This pen probably provided the blackest line, even once dry. There is a nice smoothness to the drawing experience, with a very consistent line and it is smudge-proof and waterproof in the watercolour test within 30 seconds. In terms of line texture, it’s worth saying that on the roughest papers (particularly the Langton Prestige described above) the line lost some of its smoothness. The pen barrel is shorter and slightly wider than most which I rather liked because it felt more comfortable in the hand. Also, filling the reservoir with ink from a separate bottle was not at all difficult… and rather fun. I hadn’t heard of these pens before, but will definitely be adding them to my toolbag. This solvent-based marker is popular with cartoonists, comic artists and graphic designers due to its bold black lines and of course the fact that it’s waterproof immediately. As with all solvent markers, there are lots of papers which aren’t appropriate for this pen. They were tested here deliberately on inappropriate papers for demonstration purposes. As described above, in terms of bleed-through it behaved best with the RENDR paper which is designed for this purpose. The other issue with Promarkers which becomes apparent on some papers is the issue of feathering. As above, there was the least feathering on the RENDR paper, the second-most successful being the Stillman & Birn which (as described in the paper section above) behaved almost like a bristol board with some pens, bristol board usually being appropriate for solvent markers. 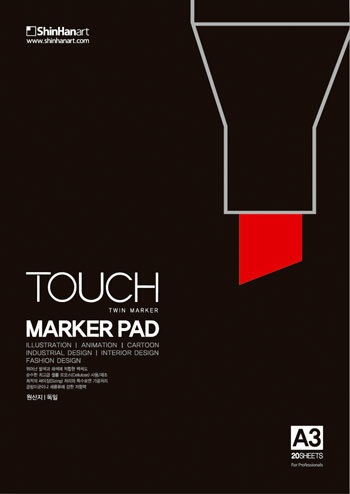 There was also reduced feathering on the Touch Twin marker pad – though of course the thinness of this paper means there’s considerable bleed-through which impacts regularly on the sheet behind. The most feathering is with the Langton Prestige. My go-to pen for almost all occasions, the Uni Pin offers the most consistent experience across papers. What I like the most about these pens is that the size of nib stated on the barrel always produces the same size line, so that I can pick up any of the 10 “size 0.3” Uni Pins on my desk and know that they will produce the same result. This is not the case with other makes of pen, whose sizes aren’t always consistent and can vary from the start, or even change shape over time as they are used. These are pigment pens which are waterproof and work well with watercolour paints. In this test I found them to be smudge-proof within 30 seconds (or less). One thing that surprised me coming out of this test was the blackness of the ink. I have tried many different drawing pens and have always found the ink in Uni Pins to be far blacker than (for example) the Staedtler series or Pilot drawing pens. However, when compared directly with other pens in this test, it became very clear that the Uni Pin ink is not as black as some others, such as the Aristo Drawing (most black) or Micron (second blackest). The Faber-Castell Ecco behaved extremely consistently across all papers. There was no feathering, no bleeding with watercolour use and the ink passed the smudge test within 30 seconds of use. It has a mid-to-high level of blackness. The flow of ink on all paper textures remained the same (unlike the Drawing Aristo on the two papers described above) however the one interesting finding was that on every paper, there was a slight weighting of ink at first use, leading to a thickness in the line at the beginning of each stroke. This is similar to the Rotring on Bristol Board described above. 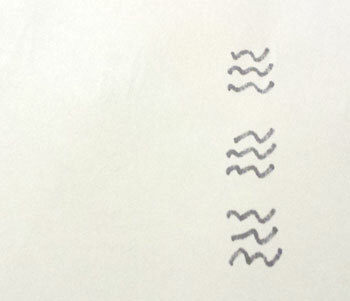 Example of initial ink weighting on Faber Castell pen stroke. The Mangaka behaved exactly as the Faber Castell above, only without the ink flow issue at the beginning of the pen stroke. The Micron pens provided a consistent line across all paper textures, being waterproof to watercolour and smudge-proof within 30 seconds. As described above the ink is surprisingly more black in appearance than that of the Uni Pin, though not as black as the Aristo Drawing. However, as the Aristo Drawing is essentially a refillable ink pen, the Micron can claim pole position as the blackest disposable drawing pen in this test. I was nicely surprised by the experience of using the Micron pen. The feel of the Micron is almost that of the cartridge or (dare I say) “real” ink pen. The feeling of the ink across paper is delightful; it feels like the ink is effortlessly flowing out onto the paper. Because of this, I would have expected to see the line weighting or tag that’s in evidence in the Faber Castell, but I saw no evidence of this. Unlike the Uni Pin (my old favourite) there is not a completely uniform line, however, that’s what makes the Microns great for sketching – that little loss of control can create happy accidents in my artwork which adds something unique. The only downside of this effect is that although the Microns go down to a size 0.05 (as does the Uni Pin range), the ink flow is such that the Micron 0.05 is more comparable to a size 0.1 in the Uni Pin. In fact there’s very little difference (in my experience) between the 0.1 and 0.05 in the Micron, whereas with the Uni Pin, the 0.05 line is astonishingly fine. Nevertheless, the pure joy of the Micron ink flow and drawing experience means that I will certainly be using it in future for any work where I need a less controlled effect and have been using them pretty much non-stop since conducting this test, just with a 0.05 Uni Pin or Rotring for those extra-light touches, texture or cross-hatching. 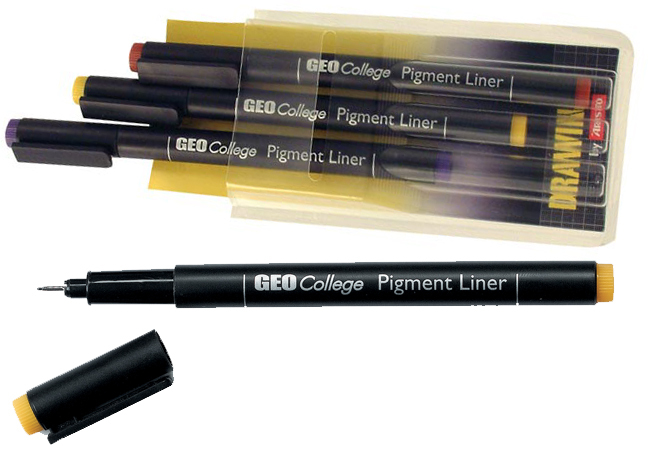 The Geo College behaved exactly the same as the Mangaka, with no early line weighting (such as the Faber-Castell), smudge and waterproof within 30 seconds and a consistent line texture across all papers. There was nothing particularly outstanding with this pen, but definitely a solid choice. The pilot drawing pens again behaved as the Geo College, Mangaka and Faber-Castell. I can detect a slight tag at the beginning of the line but no differences in pen behaviour across papers. In terms of blackness, neither the Pilot nor the Staedtler are as black as the other disposables, producing an almost grey line in comparison to the Micron. Also, having used the Pilot pens over time on other projects, I have noticed that the nib shapes tend to change, sometimes producing a sharp edge, almost like a bevel which creates a very unpredictable and uncontrollable line. The Staedtler was one of the first drawing pens I ever used. I quickly moved on to the Uni Pin when I discovered that in comparison, the Staedtler was quite grey in colour. In terms of behaviour around bleed-through and feathering, it is comparable to the Mangaka. It’s also smudge and bleed-proof within the 30 second test. 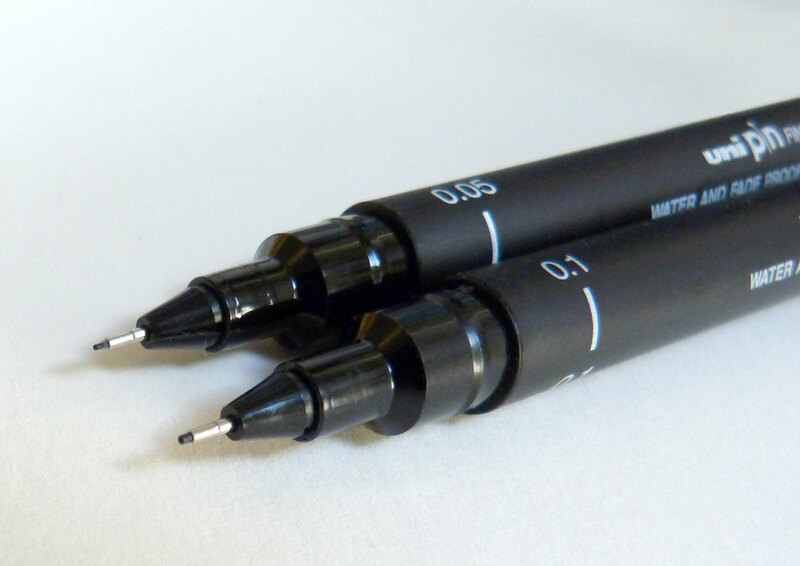 I always think of Staedtlers as comparable to Pilot Drawing Pens (described above) however this is due to greyness that they both produce in comparison to some of the other disposable pens in the test. Where the Staedtler exceeds the Pilot Drawing Pens is in the nib consistency. Staedtler nibs do not change shape over time like the Pilot Drawing Pens and are reliable in terms of nib size-to-labelling (like the Uni Pins). One thing that I have found with them in direct comparison to the Uni Pins is that the nib sizes as-labelled tend to be wider than the Uni Pins for the same size. 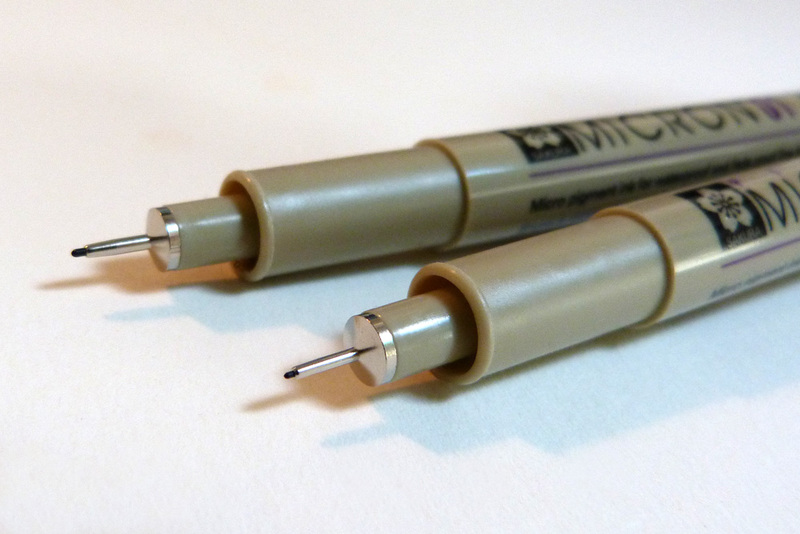 Again, this means that the Uni Pin 0.05 is the finest available nib in a disposable drawing pen that I have found. This is a very interesting brush pen which behaved very differently across papers. Firstly, it is very very not-waterproof or smudge-proof on any paper. It smudged or ran more on some papers than others, in particular on the Langton Prestige and Jackson’s paper. I once used this pen on Bristol board and it was still not touch-dry and was smearing a week later. Texture is the other major variable with this pen. 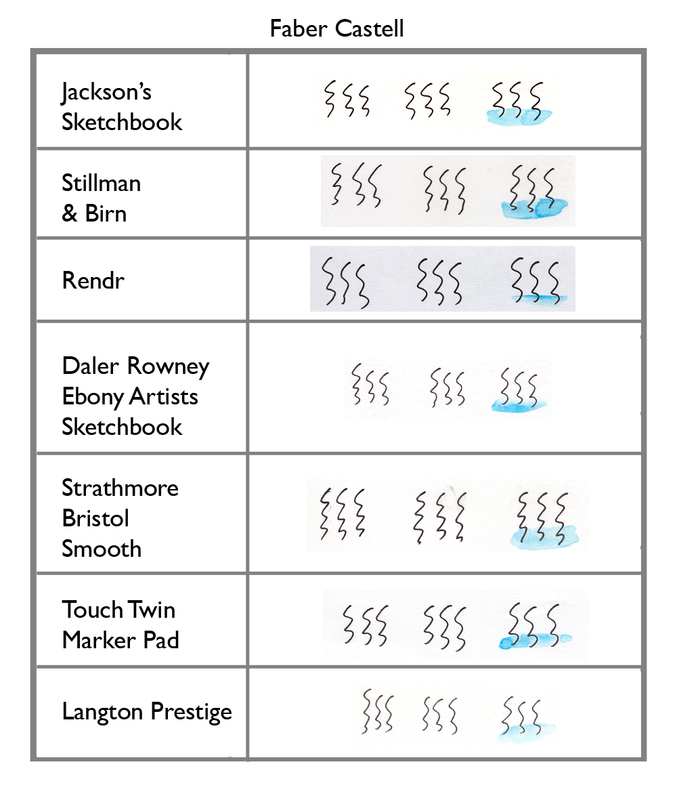 Overall it produces a coarse line – either a deep, thick black with coarse edges on the RENDR or Strathmore Bristol Smooth or an almost wax crayon-looking effect on the Langton Prestige, Jackson’s Sketchbook and Touch Twin Marker Pad. The least smudging and coarse edges on this pen were definitely achieved in the RENDR paper, with the ink being thick enough to sit on top of all papers, with no bleed-through on any paper. This is a brush pen used extensively by cartoonists and is one of my favourites. Unlike the Pentel Watercolour pen above, there’s a smoother line on several papers with the “crayon effect” only appearing on the Langton Prestige. However, as the brush above, there is a high smudge-factor (though not as bad). One interesting aspect of this brush pen is the variation in reaction to use with watercolour wash over the top of the dried ink. This ink runs considerably when used with watercolour on Langton Prestige, Jackson’s Sketchbook (these two being expected) but also on the Touch Twin and Daler Rowney Ebony Sketchbook. On the other hand, there was almost no bleed with watercolour on the Strathmore Bristol, RENDR or Stillman & Birn. I often work in dip pen as I enjoy the unpredictability and freedom of this medium compared with the more controlled Uni Pin-type disposable drawing pens. Though of course, dip pens are harder to use out in the field. I usually work with a standard pen body and a range of nibs, depending on the effect I want to achieve. For this test, I used a pen body bought from Jackson’s some time ago, with a medium nib and acrylic black ink which generally provides me with a strong black colour which does not bleed with a watercolour wash over the top. I like to use dip pens for cartooning because of the expressiveness and looseness of the lines produced which gives more movement to the work. I think of this as the equivalent of ‘painterly’ in pen and ink drawing. This pen produced the most unexpected results on some papers in this test. As I would have anticipated, the lines are black, smooth and consistent across all papers with no bleed-through to the other side of the paper. There is a slight increase in line coarseness on the more rough papers (Langton and Jackson’s for the reasons described above). For some reason, the RENDR paper which scored so highly across the most challenging pens in this test, had a very bad reaction to the dip pen, causing a massive amount of feathering from the moment the pen touched the paper. The watercolour wash seemed to make no difference to the ink which was waterproof within 30 seconds, but the line itself produced more feathering than even a Promarker on cartridge paper. I can only imagine that this is something to do with the chemicals in the paper to make it work so well with solvent-based pens. However, within this last category, the Micron definitely leads with the darkest ink. It has shown that among disposable drawing pens, there is a huge variation in flow/feel experience, colour and line consistency. 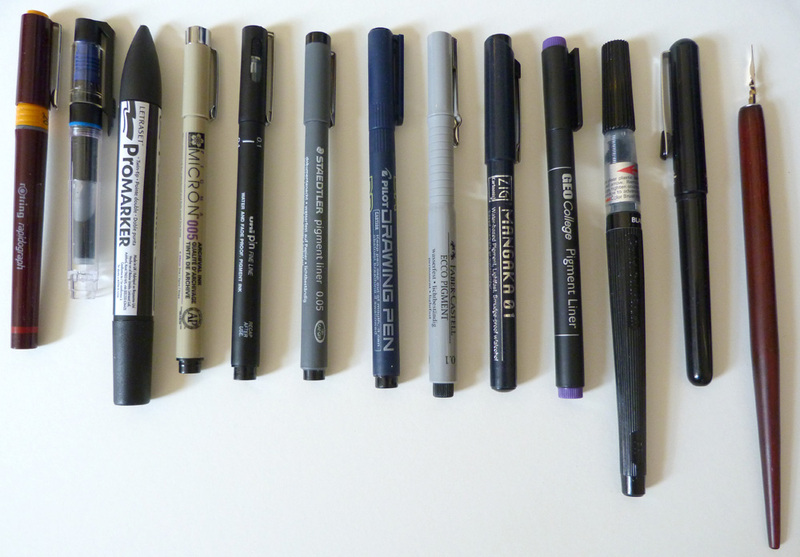 The majority of these pens are average (Mangaka, Pilot DR, Geo College, Faber Castell, Staedtler), with some having a particular strength such as the Micron on blackness and ink flow or the Uni Pin on the consistency of nib sizes and that special super-fine 0.05 which doesn’t seem to exist in other ranges. 1. Rougher texture papers (Langton Prestige, Jacksons Sketchbook, Daler Rowney Ebony) are suited to disposable pigment ink drawing pens (Uni Pin, Micron) with minimal bleed-through, feathering or inconsistency of line. 2. Smoother papers (Strathmore Bristol Smooth, Stillman & Birn) are suitable for a range of ink drawing pens and usually also for solvent-based pens, though require significantly longer drying times with non-solvent pens due to the surface coating. 3. Solvent-based pens such as Promarkers are best suited to specialist papers such as the RENDR (although this paper comes with its own challenges of colour and seems to very much dislike dip pens and/or acrylic ink). 4. 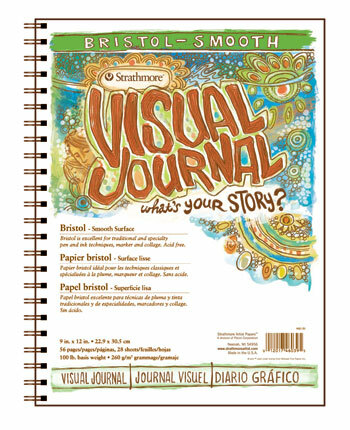 Some papers can surprise you – such as the Stillman & Birn Sketchbook – which can feel like a traditional mid-smooth sketchbook, but behave more like a super smooth Bristol Board with ink pens and even Promarkers. It has the best of graininess and the best of smoothness which makes it very versatile. What combinations most interest me for my own practice? Overall, I’m most excited with discovering the Sakura Micron pen – a disposable that has such a high level of blackness and a really enjoyable ink flow will be great to use out in the field. Also, the Aristo Drawing, though a refillable pen, is very easy to set up with minimal maintenance considering it offers the darkest black of all pens and can potentially work for me in multiple scenarios. In terms of papers, I’m really pleased with the flexibility of the Stillman & Birn across Micron and dip pen, and even the Promarker. 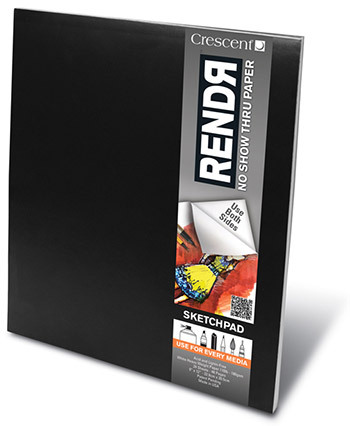 The RENDR though not for me as a day-to-day paper due to its greyness, would still work well for me on solvent-pen projects where I’m aiming to scan and convert to a digital art work. I would normally use the Bristol board for pre-digital work, but the still-reduced feathering on the RENDR might tempt me to switch over. The Langton Prestige and Jackson’s sketchbooks feel like a little bit of luxury – not right for solvents of course, but they have a really nice feel to the papers and have an added roughness which I can use with dip pens or Microns when I want to free up my line work. And of course they respond beautifully to watercolour overlays. Click on the underlined links to go to the pens or papers mentioned, on the Jackson’s Art website. Wow, brilliant article! I’m a regular user of the Unipin, Staedtler and Edding profipen, but after reading this I’m going to be trying the Sakura. The problem I have is when I use pen on watercolour paper and the ink becomes lightened when I erase the pencil marks. Hopefully the Sakura might perform better when erased if the ink is already blacker. One solution I’ve found is to use a putty rubber (http://www.jacksonsart.com/p1287/W&N_:_Putty_Rubber_:_Medium/product_info.html) rather than a harder plastic eraser.. and twist into the paper rather than scrubbing across it to remove the pencil. I think it would be helpful to do an article testing erasers. It would be good to compare the different types (plastic, soft and putty) as well as the different brands of each. Maybe on different types of paper and with different media to erase. I will work on that for the future. The best eraser I’ve tried is what they call “bread crumbs” or “malleable”. Yes, we stock many malleable rubbers, called putty rubbers or kneadable erasers. A very useful review, which I’ve printed so I can keep it – many of these pens, and most of the papers, aren’t available in the average small art shop, so the links to the Jackson’s site are helpful – you could spend an awful lot of time and money trying all these different things for yourself,,,, I’ve used one pigment ink pen – forget the make – which was fine for two drawings and then ran out. And I’ve used disposables whose ink turns brown over time – not a problem if you’re doing work for reproduction, but a nuisance if you’re hoping it’ll last for posterity! Yes, it is important for the work to last after all the work the artist puts in! Yes it’s hard to find good quality pigment pens in local art shops. A lot of the materials available will dry up or run out quickly and of course, fade. I even have problems finding some of these pens in the larger art supply shops in London. I’d definitely suggest giving some of these a try. I’ve never had any fade problems with the Unipin or Sakura Microns (so far..) and they seem to last for a very long time. The pilot drawing pens are the only ones (of those above) which have dried up or, as explained in the article, the nib has changed shape and behaved strangely.. hence I don’t really use those in my work. Other pens, like the Rotring Rapidograph above is a cartridge-based system and although the ink doesnt fade in my experience, the nibs can become blocked and require cleaning, unlike the disposable-style Micron and Unipin. Great review! Have you got any recommendatons for a pen with a fast flow rate so the lineweight increases at points when you slow down? I think the tester means that thickening when you stop when she says ‘tag’ at the end of a line. The one that she found does this the most is the Faber-Castell Ecco. Very helpful article. I am a big fan of Staedtler pigment fineliners. Can you suggest a drawing paper that is a best fit for my pen. It mostly depends on what you want it to be like. The Stillman & Birn papers are excellent for all pens. I love this article so much, I have been looking for such a complete review as this one the whole week. And that’s because I want to try the Sakura Pens but then I found out about Marvy Uchida Mayfair Pens wich are less popular than Sakura’s and I read that they work even better than your new favorite ones!! So now I’m confused, haha. Great review. I ended up buying a bunch of Micron pens, however they all turned out to be fakes, ink smeared as soon as water was introduced. FYI, These were purchased from England and not China. There is a warning on the Sakura page about fake pens. I got some real ones from the U.S. and they are great. I also like the Rotring disposables. Jackson’s Art sell both the Sakura Micron pens and the Rotring Tikki disposable pens. You can rest assured that when you buy your pens from a reputable seller they will be the genuine article. If you are in the UK, try purchasing them from Jackson’s instead of from the US, it might save you some postage and duty costs. 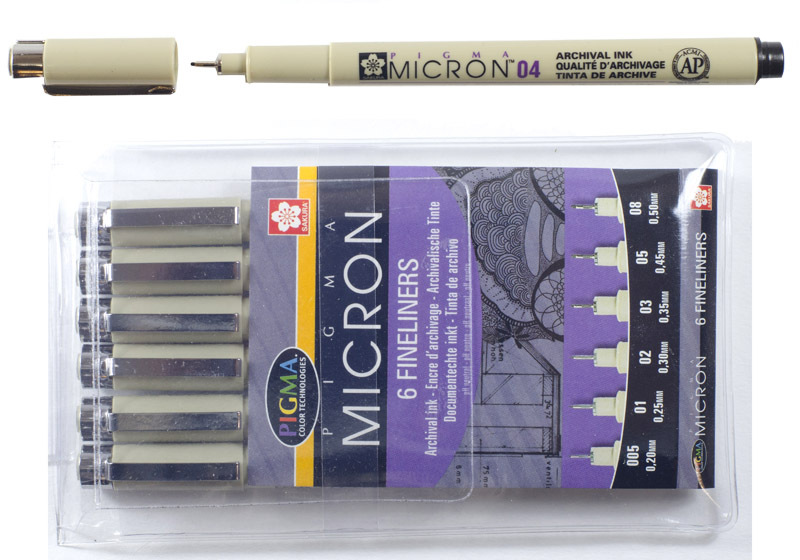 I get through a pack of microns a month, and never had a problem with the jacksons supplies. I’d avoid any eBay style or generic Internet offers for branded materials unless you know you can trust the seller, just to be in the safe side. Does the cotton paper 300g/m2 is advisable for Rotring? The tip tends to clog? In my experience, you can get away with almost any paper so long as you’re conscious of the risk and don’t press the rotring nib too hard. For example, I’ve used rotring to draw over watercolour work – ie watercolour on watercolour paper (that wasn’t as dry as it should be!) and found that so long as you’re gentle, you can keep clogging to a minimum. But if in any doubt, or if you naturally add more pressure to your work, you should aim for smoother paper – maybe hot pressed smooth watercolour or Bristol board or even marker paper is adequately sized – but jacksons can advise us on that. pens because I draw smaller and have a lot of detail. finger over the paper there you can feel the scratches. buying the Unipin 0.05 for those extra fine lines.